The Kitsap Mountaineers' Intermediate Alpine Climbing Course is a leadership development course that will teach you the techniques necessary to safely lead climb rock, snow, and alpine ice (not water ice). Course graduates will have the knowledge and skills to organize and lead basic-level climbs and to participate in intermediate-level alpine, rock, and ice climbs. 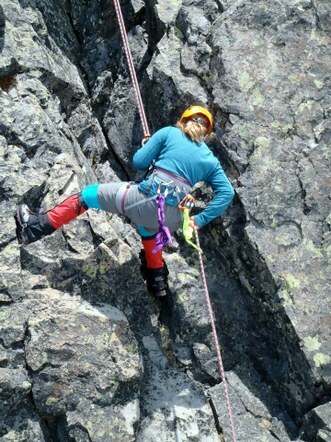 Swing leads and descend safely on multi-pitch alpine rock on routes rated 5.5. Swing leads and descend ice and hard snow safely on alpine routes up to 45 degrees. Swing leads on a basic climb in winter conditions including evaluation of avalanche hazard. Organize and lead basic level climbs. Instruct students in the basic climbing course curriculum. Completion of the Mountaineers' Basic Alpine Climbing Course or Basic Equivalency. Mountaineering Oriented First Aid or Wilderness First Aid or equivalent (needs to be current by the Rescue Methods field trip). Most students take three to five years to complete the course requirements depending upon how much time is devoted each year. Students are encouraged to take as much time as is needed to comfortably complete and master each component of the course at their own pace. The course fee is $300.00. The fee does not cover the cost of AIARE Level 1 avalanche training, covered below. In addition to the course fee there is a significant investment required for most students in gear. In addition to all the gear used in the basic climbing course, you will need to buy, rent or borrow a climbing rack (traditional rock protection), rope, ice climbing gear (tools, ice screws, etc…) and avalanche gear (beacon, shovel, probe). The branch does have a limited number of beacons available to borrow. Register and pay on line at Mountaineers.org. Note that you are not officially admitted to the course until you successfully complete the Intermediate Evaluation field trip. You have one week after the Intermediate Evaluation to drop the course and request a refund, after which no refunds will be given. Students are required to complete a Level 1 Avalanche Course certified by the American Institute for Avalanche Research and Education (AIARE) in order to graduate the intermediate climbing course. This course is required before you can attend the winter mountaineering field trip. The requirement is waived for intermediate students who have completed an AIARE-certified Level 1 Avalanche Course within five years of beginning the intermediate program. AIARE Level I equivalent certification such as from the Canadian Avalanche Association (CAA) or National Ski Patrol (NSP) is also acceptable. You must sign up for the AIARE Level 1 course separately. The Kitsap branch does not currently offer this course, but it can be taken through the Everett, Tacoma, Seattle or Foothills branches at a cost of $250. The course is also offered through Pacific Alpine Guides in Port Angeles multiple times through the season at a cost of $295, which may be more economical considering the travel costs involved in the other courses. There is no limit on the number of years a student may take to complete the course; however, we do require annual progress in the course to remain enrolled after five years from when you started. In order to add another year to your intermediate course, please contact the Intermediate Climbing subcommittee.